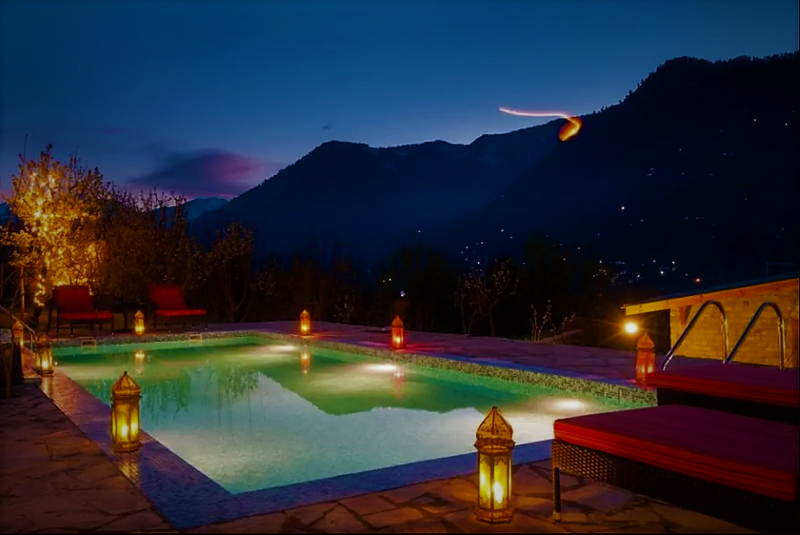 This Homestay In Manali Offers Hillside Pool, Jacuzzi With A View & Sun Deck! Listen up people, we have got something special for you travel bugs! Have you ever stayed at a homestay with a pool at the edge of the hill? Well, stop day-dreaming and hit that Bookings button rn! Because it just keeps getting better and we can’t wait to share more. LaRiSa Mountain is a bunch of beautiful cottages right at the edge of the mountains. Offering a piece of heaven with a view that melts your soul, the homestay is a place right out of a fairy tale! With offerings that range from a jacuzzi, pool table, garden fireplace and a sky deck, does it get any better than this? Your eyes can’t believe it, right? A jacuzzi with a view of the snow-capped hills. But what really takes the cake here is a romantic getaway with your bae! Imagine spending hours sitting in the jacuzzi and never believing how far you guys made it! Sublime! Now, wait-for-it, it’s gonna get better! This place will make your dreams come true. With a fire & dinner place right in the middle of nowhere, surrounded by trees, under the aegis of a sky full of stars, yes you’re in heaven! And what if you had to propose to your bae or chill with your friends, does this make-up for all the lost chilling scenes? Yes, it does! By the way, did you notice the most awesome view you could ever get? If the chill outside gets too much for you to bear while dining, you can always sit here and still take in the gorgeous views! It’s almost a panoramic view, so who wouldn’t tear up gushing about this place? Still waiting to hit the Book button? We got nothing else to brag about, so BOOK NOW! After Serving 12K Cups This Mobile Chai Cafe Will Open 100 Outlets In Delhi!